Using the right patterns and textures can effectively provide you with the desirable feeling of coziness, romance and relaxation. In this article, you will find certain ways through which you can create stunning textures for homes and some essential tips and ideas on painting furniture. Keep in mind, if you intend to use dark colors, then you should not go in for heavy textures as they will make the space appear drab and dim. When it comes to paining your furniture, then you should prepare the furniture pieces for the painting job at first. How to prepare your furniture pieces for painting? Simply, you need to remove any stain or paint or varnish on the furniture by using a chemical furniture stripper. To create a contemporary look in your home, opt for furniture pieces that have clean lines and sleek shapes. For a modern look, paint your furniture pieces in black, dark brown or white. To amaze your guests, apply two coats of paint on your furniture pieces and when they dry, apply the faux leather glaze in accordance to the manual given with the kit. For a classy and catchy look, after painting the furniture, apply well-buffed beeswax wood finish. 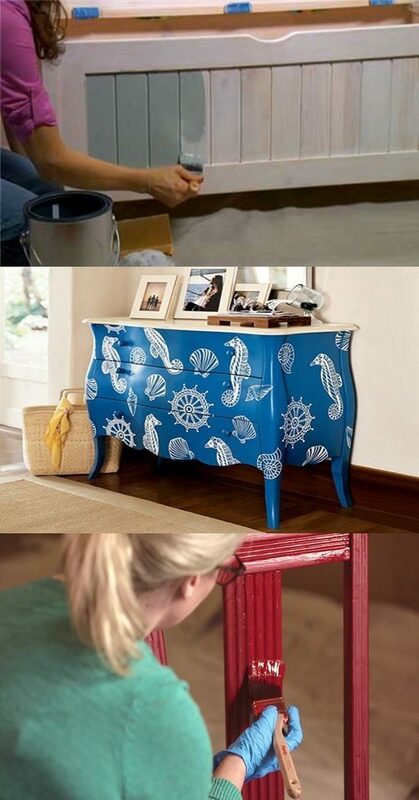 To grant your furniture pieces a unique look, all that you need is to draw some freehand paint designs on them. Likewise, you can find wonderful hand-made design ideas on the internet. But what could you do if you aren’t so good in drawing, make use of stencils to draw various kinds of patterns on the furniture or you can create stripes using a painter’s tape. A holistic understanding about essential tips and ideas on painting furniture can be gained from viewing the accompanying photos.